Environmentalists Rejoice: Court Says Land Regulation Doesn't Go 'Too Far' The court upheld a regulation preventing a Wisconsin family from developing part of their land, denying them government compensation. The decision is a huge win for regulators and environmentalists. 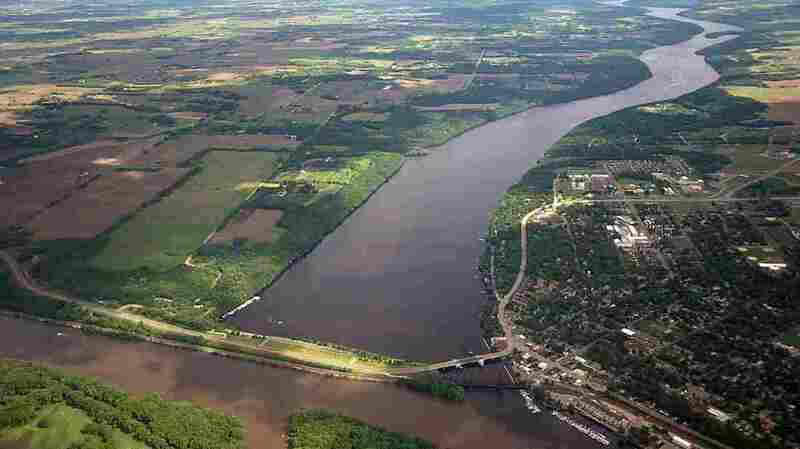 The confluence of the St. Croix, top, and Mississippi Rivers, bottom, is seen from the air on May 31, 2012. In a major property rights decision, the U.S. Supreme Court has delivered a decisive victory to state and local governments and environmental groups. By a 5-to-3 vote, the justices made it much harder for property owners to get compensation from the government when zoning regulations restrict the use of just part of landowners' property. The Constitution bars the taking of private property by the government without just compensation. The Supreme Court, for a century, has said that when the government goes "too far" in regulating property — so as to make that property economically unusable — the government also has to compensate the owner. The question is: How far is "too far"? In recent decades, property rights advocates have aggressively tried to limit regulation by demanding compensation. At the same time, cities and states have sought to manage urban sprawl, water pollution, flooding and other problems, by enacting regulations to limit what some property owners can do with their land. Friday's decision came in a case that involved two plots of land, bought by William and Margaret Murr in the 1960s, overlooking the picturesque grandeur of the St. Croix River in Wisconsin. In 1972, the river was designated for federal protection, and the state enacted regulations to preserve its scenic and recreational qualities. The regulations barred building on any lots smaller than one acre of land. The Murrs' two lots, including a cabin on one, combined to cover just under an acre of land suitable for development. Under the regulations, the lots were merged into one. After the Murrs transferred the property to their four children in the 1990s, the younger Murrs were denied permission to build on what had previously been the second lot. Under the regulations, they could build a house that was bigger than the existing one, but they could not have two houses on the two lots, which now were considered merged into one. The Murrs challenged the regulations in the state courts as an unconstitutional taking. After losing in the state courts, they appealed to the U.S. Supreme Court. But on Friday, the justices ruled in favor of the regulators. Writing for the court's majority, Justice Anthony Kennedy said that regulations that partly limit how a property owner uses his or her land do not necessarily require compensation from the state. "The provision . . . at issue here was for a specific and legitimate purpose," he observed. And he quoted Justice Oliver Wendell Holmes, who in a 1922 opinion declared that "government could hardly go on if to some extent" property values "could not be diminished without paying for every such change in the general law." Holmes made that statement in the very opinion that first established the concept of a regulatory taking. Kennedy also made a point of saying that regulations do not always detract from land value. Indeed, such regulations often enhance that value, he said, as they did here. In the end, he said, the loss in the value of the Murrs' land was only about 10 percent. Kennedy said that "no single test" is determinative of which regulations are sufficiently onerous to deserve compensation by the state. Instead, he said that, as in the past, "courts must consider a number of factors," including "the treatment of the land under state and local law; the physical characteristics of the land; and the prospective value of the regulated land." For property rights advocates, the decision was a genuine blow. John Groen of the Pacific Legal Foundation, which brought the case, called it "a shock," adding that the decision "undermines traditional understandings of property rights." William Treanor, Dean of Georgetown University Law Center, said the decision would have a profound effect in cases involving wetlands. He said property owners across the country have been demanding to be paid by the government because they are unable to build on some portion of their land that is protected wetland. Those claims, Treanor said, will now be much harder to make. Harvard Law Professor Richard Lazarus called the decision a "clean, big win for both government regulators and environmental protection." "There is no nuance to the ruling," he said. It is a "soup to nuts" win for the government, and environmentalists. The reason, he explained, is that when the government regulates land owned by private individuals, "it almost never says that you can't do anything with all the property you own. It just looks at the most environmentally sensitive part, and restricts your use of that piece." Justice Kennedy's decision was joined by the court's four liberals: Justices Ruth Bader Ginsburg, Stephen Breyer, Sonia Sotomayor and Elena Kagan. Chief Justice John Roberts wrote the dissent, joined by Justices Clarence Thomas and Samuel Alito, saying that the court should have a clearer, bright-line test for what constitutes a taking. Roberts acknowledged that the test he suggested might have ended up with the same result, meaning the regulations at issue would not have amounted to a taking of private property, and the Murrs would not have qualified for compensation. The case was argued in March, prior to the confirmation of Justice Neil Gorsuch, so he did not participate in the decision.